* 4 Delay lines per instrument. * Reverb and chorus effects. 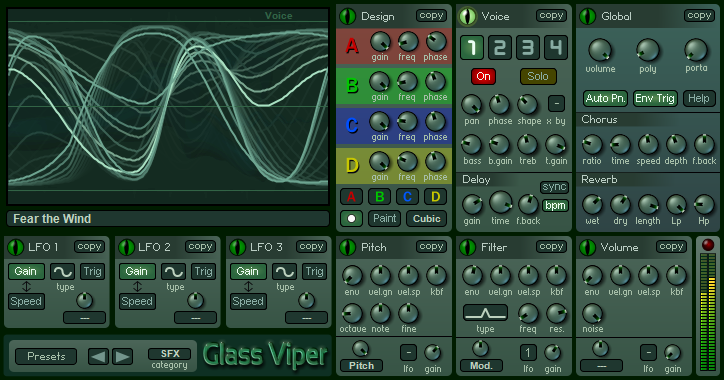 Glass Viper's moving waveform is the fundamental to its sound. When a note is held, the sound can move in a natural and pleasing way, without repetition. 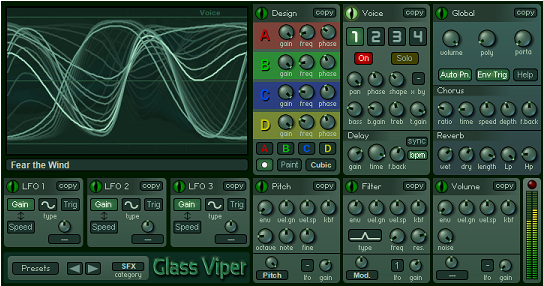 Like RaySpace, the visual aspect is also a major part of Glass Viper, guiding the user to a more experimental and less mathematical route to sound creation. The main display will change depending on which panel you are selecting. On the Voice panel the four waveforms of the currently playing note are directly displayed. On the Global panel the actual whole output waveform is plotted. And on the Waveshaper panel, you can edit the waveforms in real-time so you can really get the feel of the sound creation process. There is an extensive copy and paste algorithm, which enables you to copy either each panel, voice or whole (4 voices) instruments - this speeds up the sound creation process enormously, and also allows the user to use parts of different presets to make new ones. * 256 categorised factory presets. Available to purchase on the Luftrum site. Includes many lush pads, textures and synths.